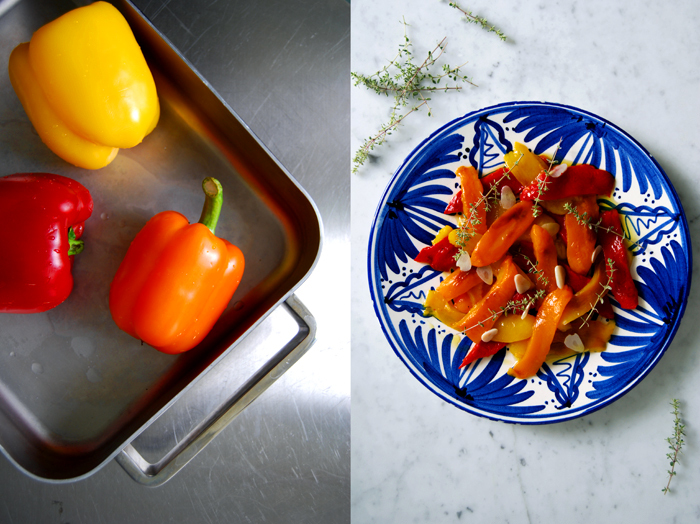 When I see juicy strips of grilled bell pepper on an antipasti platter, colourful in red, orange and yellow, I can barely stop myself from eating all of them (which is unfortunate for my antipasti platter companion). I love this balanced taste of sweet and smokey, it’s addictive! There are many ways to do this, some prefer to grill the fruit cut in half, some say you should cook it whole in one piece. Peeling the skin off can be a bit fiddly but it’s manageable, there are many suggestions to make this part easier. The latest I heard was to put the grilled bell pepper in a plastic bag and shake it to get rid of the skin although I’ve never tried it myself. 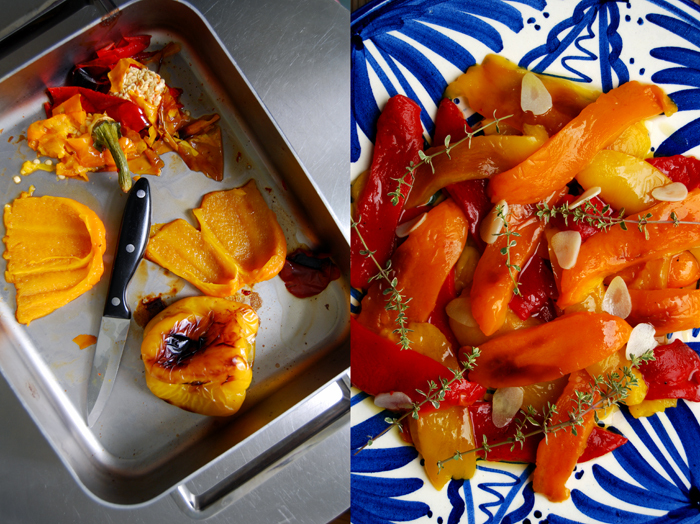 This is how I grill and peel bell pepper, how I’ve done it for years and it works perfectly: I put the whole fruit in a baking dish under the grill, turning it as soon as one side gets dark (meaning partly black). When the skin is dark and burst all around, after about 25 minutes, I open the oven, take out the dish and lay a wet kitchen cloth or paper towel over the bell peppers to cover them completely. I wait just a few seconds as they should stay warm and moist for this process. Then, I take out one pepper after the other and pull the skin off with a knife. If you leave them to cool without the moisture it’s impossible to peel them without damaging the flesh. Sometimes I grill a big batch of bell peppers, I cut them in thick strips and keep them covered in olive oil in the fridge for days. 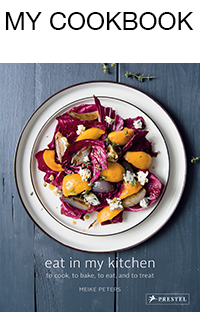 Apart from the fact that it is a convenient (and healthy) nibble, it’s perfect for an antipasti platter at one of our dinner parties, as a salad or to make sandwiches. 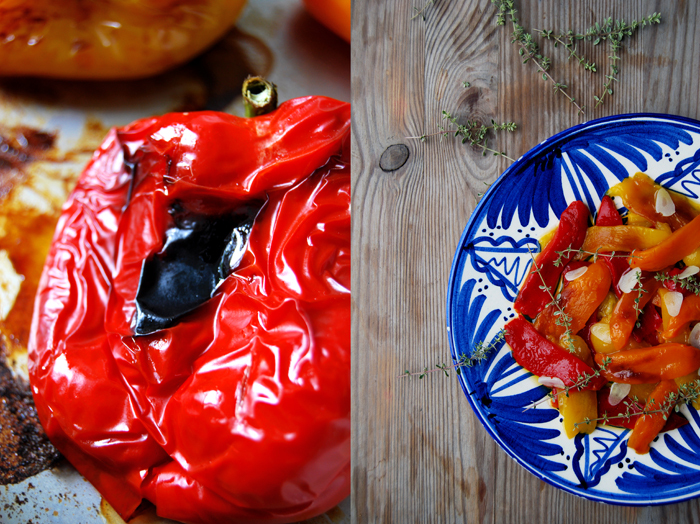 This time I grilled only three peppers and marinated them in garlic infused olive oil and fresh thyme. They didn’t last very long! In a sauce pan, warm up the olive oil and garlic for 3 minutes on a medium-low heat to infuse the oil, the garlic shouldn’t change colour. 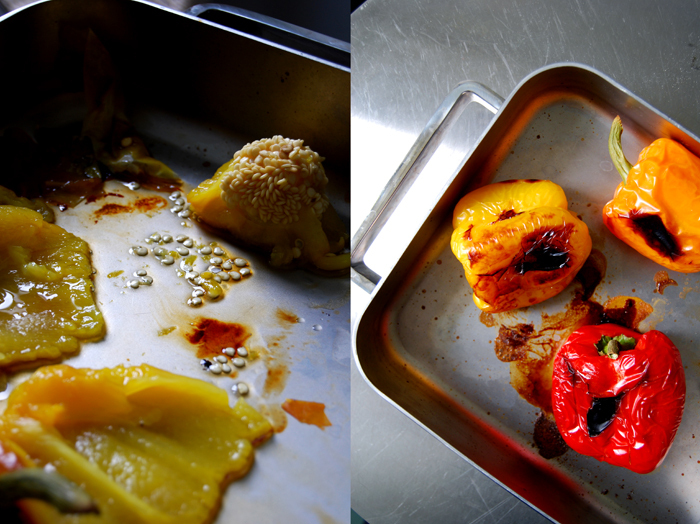 Put the bell peppers in a baking dish under the grill and turn them as soon as one side gets dark and starts to burst. I turned them twice, after 10 minutes on each side, I cooked the third side for only 5 minutes. Take the baking dish out and cover with a wet kitchen cloth or paper towel immediately. Wait for 10 seconds, take out one pepper and peel it with a knife. Keep in mind that they are still hot, especially the inside! Cut the peeled fruit in half, take out the seeds and cut the bell pepper into strips. 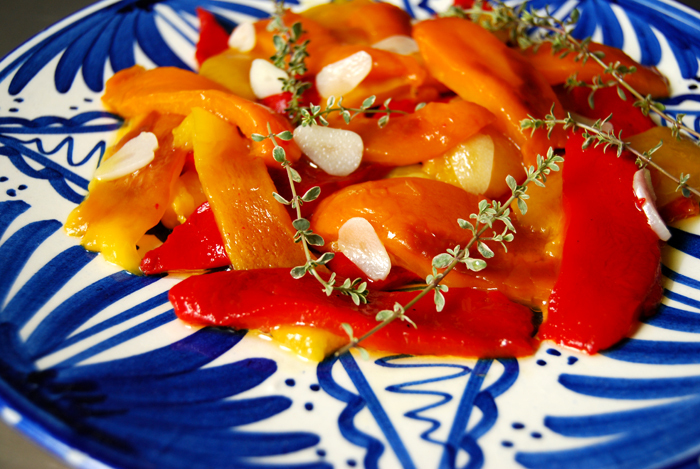 Pour the olive oil over the bell peppers and sprinkle with the garlic and thyme sprigs (or just the leaves if the sprigs are hard and woody). You can season it with salt and pepper but I left it pure. 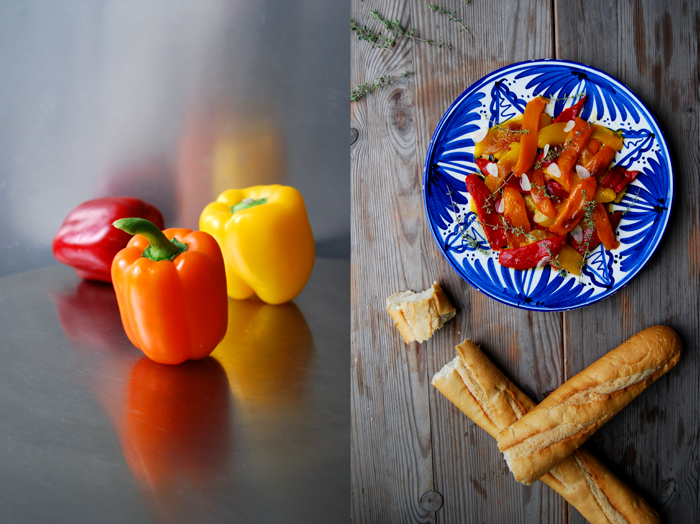 Thank you Mary, it’s a great summer dish when the bell peppers are ripe and sweet! Two words come to mind…Colorful yumminess!